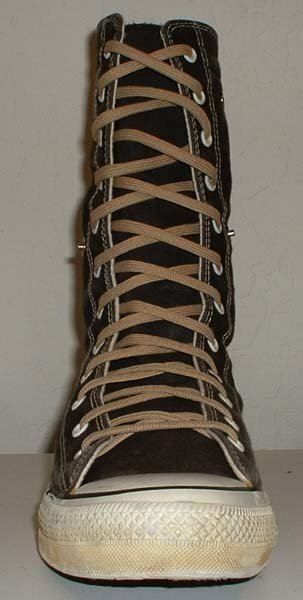 Photo gallery of 84 inch and 96 inch skate laces on various pairs of knee high chucks. 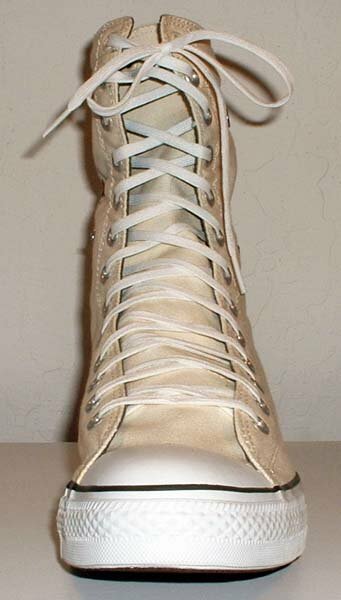 1 Skate Shoelaces on Knee High Chucks White 84 inch shoelaces on a right black knee high. 2 Skate Shoelaces on Knee High Chucks White 96 inch shoelaces on a left black knee high. 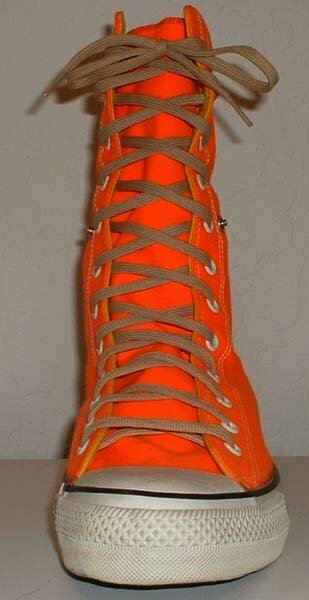 3 Skate Shoelaces on Knee High Chucks Black 84 inch shoelaces on a right orange knee high. 4 Skate Shoelaces on Knee High Chucks Black 96 inch shoelaces on a left orange knee high. 5 Skate Shoelaces on Knee High Chucks Tan 96 inch shoelaces on a right parchment knee high. 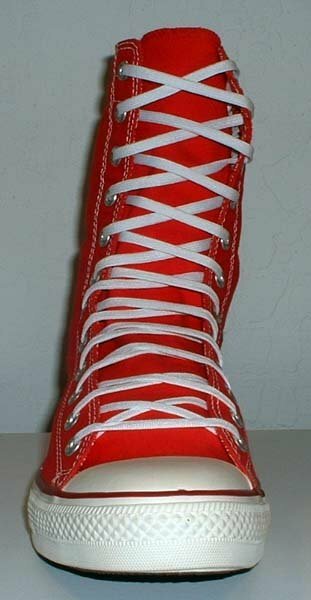 6 Skate Shoelaces on Knee High Chucks White 96 inch shoelaces on a left red knee high. 7 Skate Shoelaces on Knee High Chucks Black 84 inch shoelaces on a right black knee high. 8 Skate Shoelaces on Knee High Chucks Tan 84 inch shoelaces on a right black knee high. 9 Skate Shoelaces on Knee High Chucks Black 96 inch shoelaces on a left black knee high. 10 Skate Shoelaces on Knee High Chucks Tan 96 inch shoelaces on a left black knee high. 11 Skate Shoelaces on Knee High Chucks Tan 84 inch shoelaces on a right orange knee high. 12 Skate Shoelaces on Knee High Chucks White 84 inch shoelaces on a right orange knee high. 13 Skate Shoelaces on Knee High Chucks Tan 96 inch shoelaces on a left orange knee high. 14 Skate Shoelaces on Knee High Chucks White 96 inch shoelaces on a left orange knee high. 15 Skate Shoelaces on Knee High Chucks Black 84 inch shoelaces on a right parchment knee high. 16 Skate Shoelaces on Knee High Chucks Tan 84 inch shoelaces on a left parchment knee high. 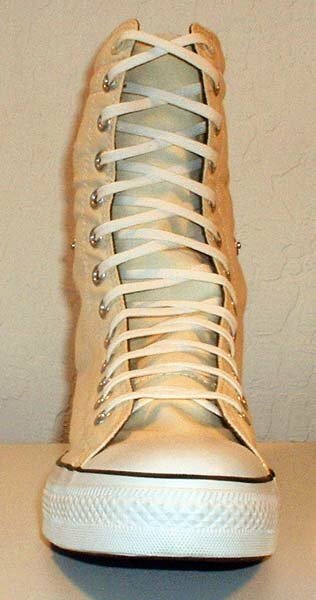 17 Skate Shoelaces on Knee High Chucks White 84 inch shoelaces on a right parchment knee high. 18 Skate Shoelaces on Knee High Chucks Black 96 inch shoelaces on a left parchment knee high. 19 Skate Shoelaces on Knee High Chucks White 96 inch shoelaces on a left parchment knee high. 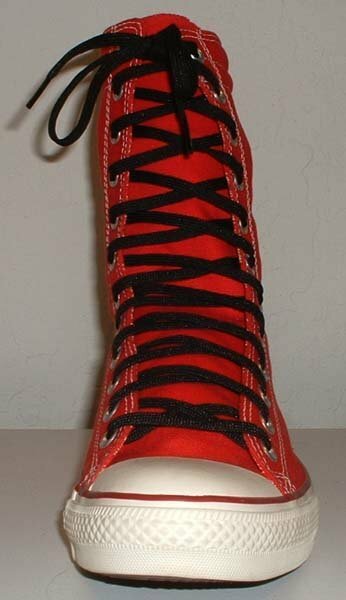 20 Skate Shoelaces on Knee High Chucks Black 84 inch shoelaces on a right red knee high. 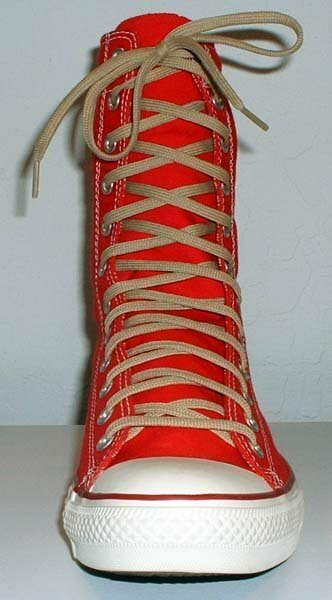 21 Skate Shoelaces on Knee High Chucks Tan 84 inch shoelaces on a right red knee high. 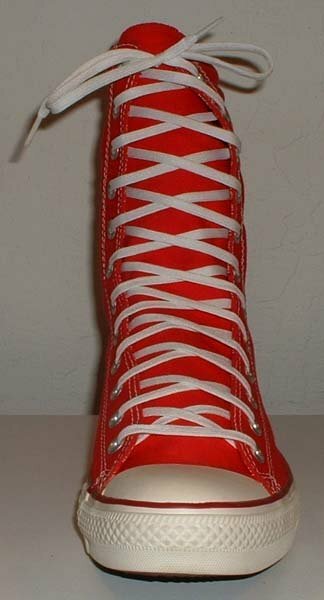 22 Skate Shoelaces on Knee High Chucks White 84 inch shoelaces on a right red knee high. 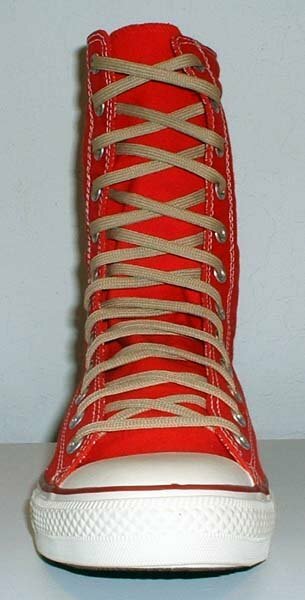 23 Skate Shoelaces on Knee High Chucks Black 96 inch shoelaces on a left red knee high. 24 Skate Shoelaces on Knee High Chucks Tan 96 inch shoelaces on a left red knee high. 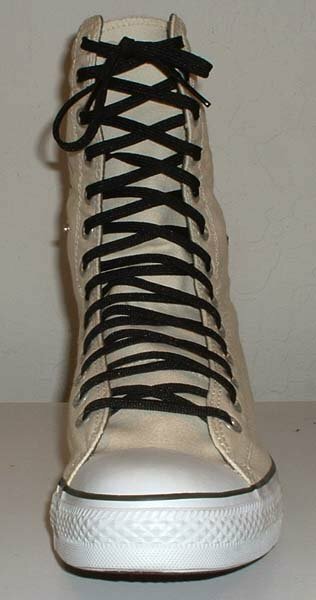 These are flat and narrow athletic laces available in three colors. 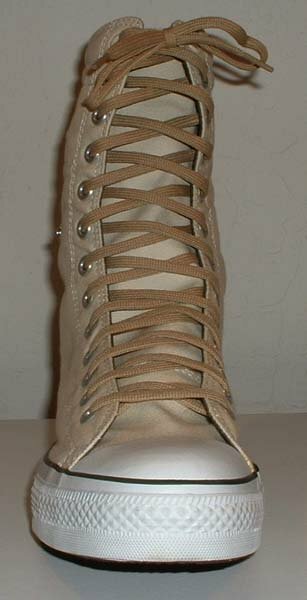 96" laces have plenty of length for lacing at the 12th eyelet pair. 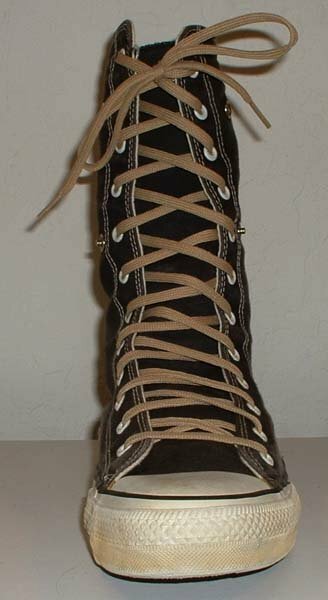 84" can be laced to the 11th eyelet pair with plenty of tie length, or to the 12th eyelet pair and laced through the eyelets in the tongue of most knee high models or tied off with a small knot.